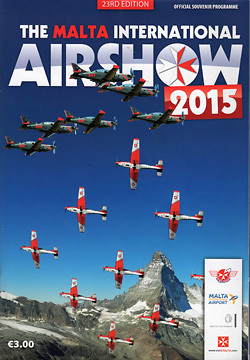 The last weekend in September sees the small Island nation of Malta hosts its very own International Airshow. While certainly not the largest event on the calendar, Malta always manages to bring together a fascinating array of nations and aircraft often not seen anywhere else in Europe. The 2015 edition of the show saw a welcome return by the Egyptian Air Force plus an international debut from the Hellenic Air Force. The Maltese Islands have always been an important staging post between Europe, Africa and the East and a vital strategic link during any conflict in the Mediterranean region. During the Second World War, Malta was one of the most bombed regions in the World as the Allies and Axis powers fought for supremacy in Southern Europe, the Middle East and North Africa. For both sides, the Island’s harbours were key to naval operations. It remained so during the Cold War remaining an important outpost for the Royal Navy and Royal Air Force. Even today, the Harbours and Malta International Airport are a key stop off for shipping and air transport. The Maltese Islands’ role as a key link between East and West are often reflected at the International Airshow which brings together nations not often seen elsewhere. Following the Libyan Crisis, the International Airshow saw the début of the newly reformed Free Libyan Air Force in 2011 with a pair of Mirage F1s and Illuyhsin Il-76. 2012 saw the Libyan Air Force return, this time with a Boeing CH-47C Chinook that also appeared in the Flying Display on the second day of the event. Last year saw the Egyptian Air Force make their début with the Hougdu K-8E Karakorum and Lockheed C-130H Hercules on static display. They returned again this year with the same aircraft types for static display, though the K-8E came from the Egyptian Air Force’s National Display Team, the “Silver Stars.” Formed in 1974, the team re-equipped on the Chinese designed advanced jet trainer and light attack aircraft in 2003. As last year, the Egyptian’s displayed the K-8 with a large selection of weapons the aircraft can carry in its light attack role. Beside the K-8 was another of the highlights of the static display, a pair of Hellenic Air Force Dassault Mirage 2000-5 Mk2 fighters. These aircraft are rarely seen away from Greece so it was great to see them at Malta enjoying a great deal of attention. Another jewel amongst the Malta static park was a Romanian Air Force Alenia C-27J Spartan. Though the Romanians and their C-27Js have been to Malta on operational taskings, this was the nation’s début at the International Airshow. The C-27J was not the only transport aircraft from Europe on show, a Belgian Air Force C-130H Hercules from 40 Squadron was joined by a Polish Air Force Airbus Military CN295M while the Italian Air Force’s Reparto Sperimentale Volo sent a Piaggio P180 Avanti. All three of these aircraft were supporting aircraft for flying display items. It was good to see the United States armed forces return to Malta with two aircraft. From the United States Air Forces in Europe came a Lockheed Martin C-130J-30 Hercules II from Ramstein AFB which was opened to the public for walk-throughs. The US Navy also returned to Malta with a Lockheed P-3C Orion, though this year it was the turn of VP-9 to show off the type. VP-9, otherwise known as the Golden Eagles, is based in Hawaii but was supporting operations in the Mediterranean at the time of the show. Alongside the P-3 was a Canadian Armed Force’s Lockheed CP-140 Aurora from 415 Squadron making a very rare European airshow appearance. Though they are based on the P-3 airframe, the CP-140 boasts a different array of internal systems and sensors for the Canadian requirements. Somewhat less imposing than the North American aircraft was the Polish Navy’s PZL M-28-1R Bryza which is also a maritime patrol aircraft and regular sight at many European airshows. While it has a shorter range, the Bryza still plays an important part in protecting Poland’s maritime interests and in the Search and Rescue role. Completing an impressive collection of surveillance aircraft was a NATO Boeing E-3A Sentry. The E-3A is always a popular attraction at Malta with long queues forming for cabin tours throughout the day. The UK armed forces are always good supporters of the Malta International Airshow. The only Royal Air Force representation at the show was on static display with a Beechcraft King Air B200GT from No 45(R) Squadron and a pair of Eurofighter Typhoon FGR4 and T3 from No 1(F) Squadron. The Royal Navy complemented the King Air with one of its own Beechcraft Avenger T1s from 750NAS and a 814NAS Westland Merlin HM2 from RNAS Culdrose. 750 NAS have strong links to Malta as they formed part of the Observer School based at RNAS Hal-Far on the island between 1959 and 1965. An interesting civilian addition to the static display was an AgustaWestland AW189 from Gulf Helicopters based in Qatar. The AW189 was in Malta supporting offshore operations around Maltese waters and is part of a very diverse and modern fleet operated by the Qatari company. As ever, Maltese Aviation was well represented. The local microlight club and local aviation company had many aircraft on show in the static display. The Armed Forces of Malta too had their traditional exhibition alongside a selection of aircraft many of which also appeared in the flying display. It was the Armed Forces of Malta that opened the flying displays on the Saturday with their Aerospatiale Alouette III performing a flag flypast alongside the crowd-line. However, this was not the end of their involvement in the flying. This year saw a unique pairing of the AFM’s newest aircraft types, the Beechcraft King Air B200 and AgustaWestland AW139. The two dissimilar aircraft were flown in close formation for a number of passes before spitting for some solo hovering from the AW139 and flypasts from the King Air. The AFM also played an important role in the first of the UK contributions to the flying. The British Army’s Tigers Freefall Parachute Display Team were taken aloft by an AFM Britten Norman BN-2T Islander. The team, from the Princess of Wales Royal Regiment, presented two different displays over the two days of the airshow. As well as the traditional flags and parachute jumping, Saturday saw two members of the team perform a wing-suit jump which proved a little hard to see in the deep blue skies. Sunday saw more emphasis on Canopy work with a “triplane” formation performed almost until the jumpers reached the ground. With the RAF absent from the flying, it was left to the Royal Navy to provide the only UK flying display with the Black Cats Helicopter Display Team making their Malta début. Just getting the team to Malta was a major operation with the team’s AgustaWestland AW159 Wildcat HMA2 helicopters transported to Malta on board two RAF C-17A Globemaster III aircraft. This was the first time Wildcats had been deployed in such a way and was valuable training for both Royal Navy and Royal Air Force crews. The team are drawn from 825 Naval Air Squadron which carries the Maltese Cross on its squadron badge marking its time based at RNAS Hal-Far (otherwise known as HMS Falcon) during the 1930’s and early stages of the Second World War. As well as the Black Cats, two other big military display teams took part in the flying displays. Often underrated, the Swiss Air Force’s PC-7 Team are one of Europe’s best formation display teams. Flying the Pilatus NCPC-7 Turbotrainer, their display has been dramatically enhanced since 2014 with the addition of smoke generators to the display aircraft. With the agility of the PC-7, the team keep their display in front of the crowds at all times and with some very dynamic formation changes. Also flying turboprop trainers were Team Orliky, one of the Polish Air Force’s two aerobatic teams. The team fly the indigenous PZL PZL-130TC-II Orlik trainers hence the team name. The Orlik is a much more aggressive looking machine with shorter, more swept wings and tail surfaces. As well as big formations the Orliky’s solo pilots performed some very dramatic crosses and a very close mirror turn. The Italian Air Force contributed two different helicopter displays to the show. The Malta based Agusta-Bell AB-212AM from Missione Italiana di Assistenza Tecnica (MIATM) put on its traditional Search and Rescue demonstration. With its older system of just two rotor-blades, the AM-212 makes the wonderful “whop-whop” sound of the Vietnam era “Huey” helicopters. However it may be a sound soon not to be heard over Malta as the AFM modernises with its AW139 helicopters taking over more of the SAR responsibilities. The latest helicopter technology was demonstrated by the Italian Air Force’s Reparto Sperimentale Volo with the brand new AgustaWestland AW149. The helicopter displayed by the RSV crew was so new in fact it was yet to receive its military markings and still wore its manufacturer’s test registration. The RSV pilots put the aircraft through a fairly gentle routine, perhaps reflecting the short time the AW149 had been in service with the Italian military. A very addition to the display line-up and something of a coup for Malta International Airshow was the international display début of the Hellenic Air Force’s Beechcraft T-6A Texan demo team “Daedalus.” The team sent two aircraft with one in the flying and a further airframe in the static display. Prior to Malta, the team had only displayed over their homeland. Like their compatriots from the F-16 Demo Team “Zeus” the team have received training from their equivalent in the United States Air Force and that is reflected in the style of their display. It includes the likes of the “Dedication Pass” plus some very precise and regimented aerobatics, max-rate turns and so on. It is good to see the team spread their wings however and we hope to see them come further North and West in Europe in the future. The display finale was the only fast jet display of the afternoon, the Belgian Air Force’s F-16AM Fighting Falcon solo display flown by Cdt Tom “Gizmo’” De Moortel. In these more austere times, it is more and more difficult for civilian airshows to support military aircraft, particularly fast jets so it was good to see the hard-work of the Malta airshow volunteers rewarded by the dramatic F-16 solo display. 2015 was certainly a great year for the enthusiasts at Malta International Airshow who were treated to very varied static and flying displays in some great weather. Such an enjoyable show is only possible with some very hard work from the organising team and the volunteers that make it happen and they must all be congratulated.